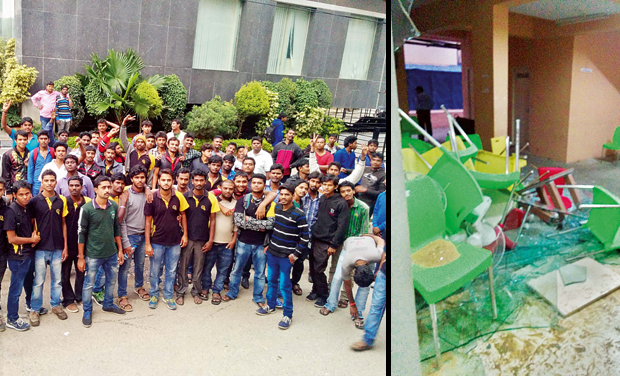 Bengaluru: Over 100 delivery boys of logistics startup Roadrunnr damaged office furniture and protested against the company’s changed salary structure, in Ejipura on Saturday. The delivery boys, who were earlier being paid on an hourly basis, will now be paid by Rs 35 per delivery, which the protesters claimed would reduce their salary by nearly half. The protesters alleged that they earlier made around Rs 25,000 per month, but with the changed policy, it would come down drastically. “Earlier we got Rs 50 per hour and extra for number of deliveries. Our monthly earnings were around Rs 25,000. Now with only Rs 35 per delivery and with an average of hundred orders a month, we will make only Rs 3,500,” said Shivu, one of the delivery boys. “We wanted to talk it out, but the situation got aggravated when the owner said it’s his company and can do what he wants with it. That’s when delivery boys got mad and started breaking office stuff,” he said. The delivery boys also said that the company has also hired 15 bouncers, anticipating trouble, they said. The protesters said they demanded a three-month salary as compensation as they all wanted to quit after the change in policy. “They should have given us at least a week’s notice before implementing the new policy. They changed basic salary from Rs 18,000 to Rs 15,000, discontinued conveyance allowance and have now changed the payment policy,” an employee said. The management at Roadrunnr called for police assistance after the employees started causing damage. “We have changed our payment policy and the delivery boys are resisting it. Initially it was on hourly basis, now it’s on per order; so the lazy ones are resisting it,” said Mr Vivek Poddar, senior manager of operations at Roadrunnr. “We are in touch with the police. Our director of operations is in police station talking to the cops and we believe it will be sorted out soon,” Mr Poddar said. He also said that the hundreds protesting were just the “bad drivers” from their delivery crew of 1000 people. “The rest are out there providing services,” he said.